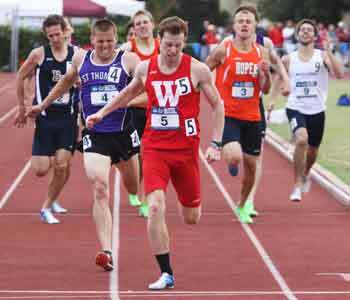 After two second-place finishes, Wabash College junior track star Jake Waterman would not be denied. He led from start to finish to win the 800-meter run at the 2012 NCAA Division III Outdoor Track and Field Championships and capture his first national title. Waterman finished in 1:49.41, edging out Mike Hutton from St. Thomas (MN) who finished second with a time of 1:49.78. Waterman finished second in the indoor 800-meter run in March after finishing second in 2011, as well. View photos from Waterman's victory here. "I don't think it's all set in yet," Waterman said shortly after receiving his first-place trophy from Wabash Assistant Coach Roger Busch. "It's still a little surreal. This was really the coaches' expectation all year for me. It was my expectation for me too. I feel really good about the effort. "For the first time this race went exactly the way I had it planned out in my mind. My intention was to lead the whole thing and stay out of traffic. I found out after the race was over that there was a lot of battling for positions behind me, so I was very fortunate to be able to stay out of that traffic." Waterman raced to the front of the pack from the fifth starting spot and never looked back. With about 200 meters left, he made one final surge that kept him in front and led him to the finish line. "I'm very, very, very, very proud of Jake and his effort today," Busch said. "Jake just never complains, he loves running on the big stage, he listens, he has matured as a runner and competitor. He's just very coachable. Coming up short twice in the indoor meet and having a rough go at last year's outdoor championships, it's just very exciting to see him reach this achievement." 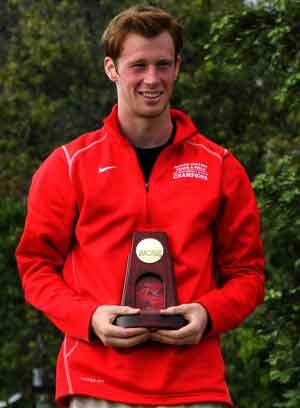 Waterman becomes the second national champion for the Wabash track and field program this season. Kevin McCarthy won the mile run at the indoor championships in March. McCarthy finished third in the 1500-meter run on Saturday to join Waterman as an All-American at the 2012 outdoor meet. "We just wanted Jake to be patient until about 150 or 200 meters," Head Coach Clyde Morgan said. "At that point the race was over. Jake wanted it bad. There was nothing else in his eyes. When you're second twice there is nothing else to shoot for. "Toughness, that's what Wabash is. It's a tough place. When you walk around you can feel it. That's what Jake and these guys are doing out here today. When Jake won yesterday in the prelims you could see that toughness on his face." "I think we are starting to develop a culture where our guys know that they're in with a good group of guys who are all willing to work hard," Busch said. "Jake said it best earlier in the week. We have guys who work hard when they come to practice every day. That's what our program is about from the 100-meter dash all the way up to the 10,000-meter run. They know if they show up every day and work hard that they can get better and better. That's all we can really coach. Their expectations get higher now."